You have seen holographic displays being used in science fiction movies and you might have always wondered when the technology will make its way to the common people like us. Don’t wonder no more, for it has. You must be thinking it would be quite expensive, but that is not the case. 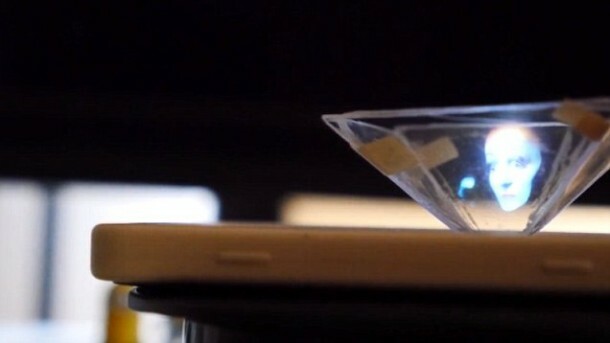 All that you need is the front of an old CD case along with a few bits of sticky tape and you can transform your very own smartphone into a hologram projector on your living room table for just a few bucks. A video that explains the hack where a fluorescent jellyfish can be seen hovering in mid-air and a butterfly can be seen flapping its wings. 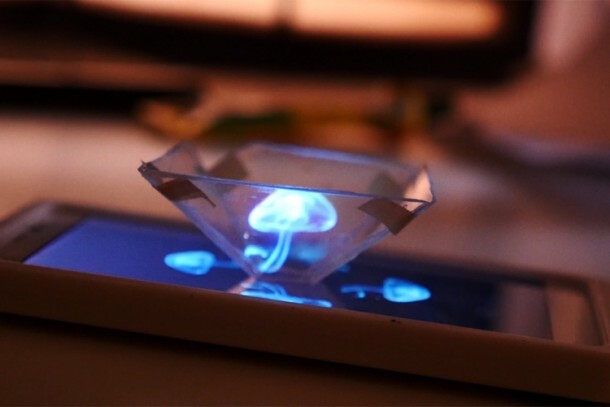 All that you need to build this awesome hologram are a few household items. You will need a sheet of graph paper, a pen and a ruler for drawing a basic trapezium that will serve as the blueprints for the gadget. The dimensions used in the video are 0.4 x1.4×2.4 inches. However, these can be doubled or tripled as per your requirement. You’ll also need an old plastic CD case and a sharp knife or glass clutter for building the sides of the projector. By making use of the trapezium drawn on graph paper as a template, cut the shapes out of the plastic. You will need a total of four such shapes. These shards will be able to fit together and you can glue/tape them together to hold them in place. Place this contraception on top of your smartphone while it plays a Youtube video designed for this specific purpose. You can check out the video here. Once up and running you’ll be able to enjoy the 360degree viewing angle of the holographic video. The CD case basically provides enough reflection so that the light bounces from the image being shown on the screen. Since the plastic is transparent, you are also able to see straight through it thus creating the illusion of the reflected object hovering in mid-air. Since the video plays on all sides of the reflector it can be viewed at any angle from the room thus reinforcing the idea of a physical object being projected.